Sunshine Kitty aka Sunny was one of Crazy Cat Lady Carm's seven beloved cats. Unfortunately, he passed a couple of days ago when the vet found that his heart and lungs were filled with fluid resulting from some devastating disease. With his tearful Mom and Dad beside him, he was put to sleep after twelve and a half years of a most happy existence with his parents and his kitty siblings. Sunny has left them with so many good memories and a legacy of love. 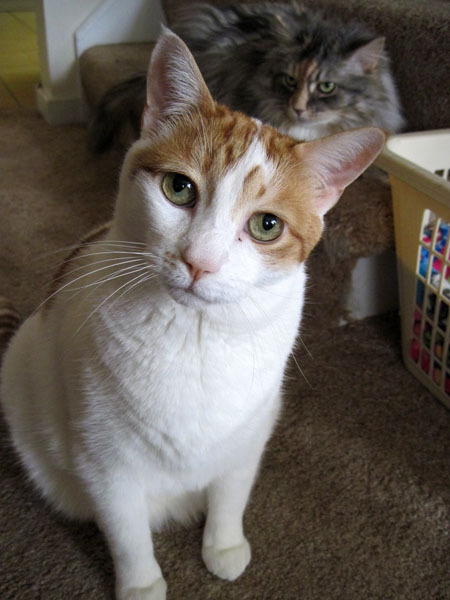 Sunny and his brother Moony were littermates, and never a closer pair has one ever seen. 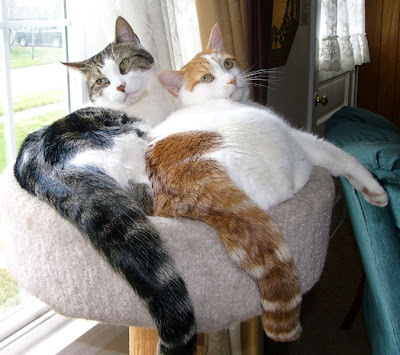 They were barncats who were adopted at the same time when they were just tiny kittens. It seems that they were literally joined at the hip. Sunny and Moony at 6 weeks old. 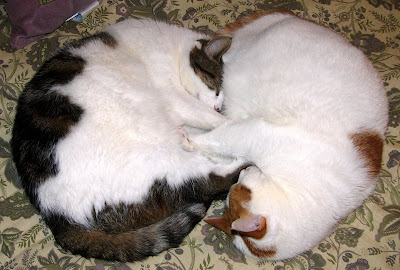 Sunny and Moony were most often seen together, and were famous for their synchronized sleeping positions. Here are but a few. 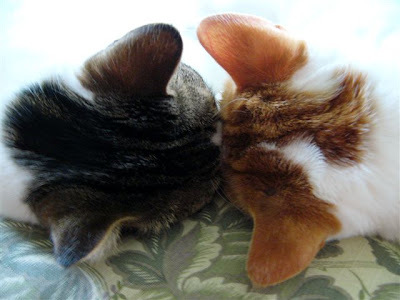 It's like they had a mind-meld which allowed them to precisely mirror the sleeping position of the other -- whether it was head to toe or head to head. 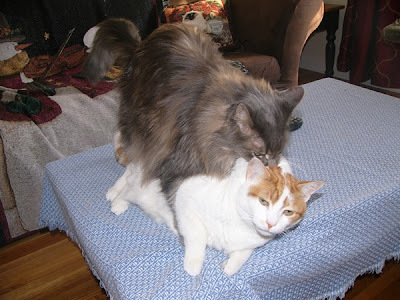 Despite his powerful bond with his brother Moony, Sunny was an equal opportunity lover. He reminds me of that song "If you can't be with the one you love -- love the one you're with!" 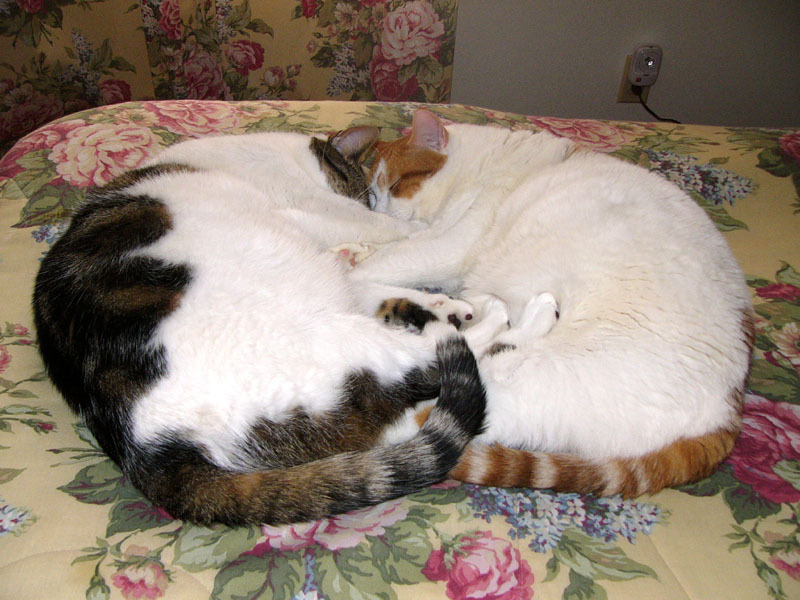 Here's Sunny snuggling up to his sister, Candy. 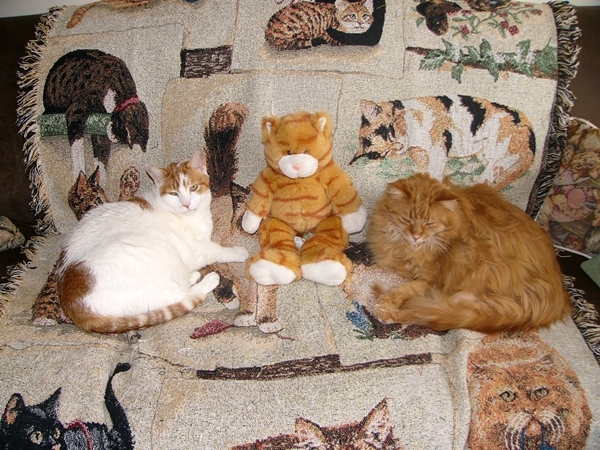 And taking "Pride" in being a redhead (with his brother Pride and friend). Getting up close and a little too PURRsonal with his sister, Joy! Letting his brother Tommy have his way with him! Sunny was so easygoing. Having a post-grooming taste of his brother, Furby. "He has flavor!" 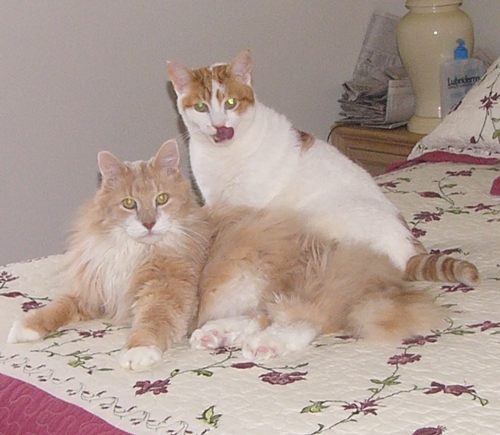 In a general furpile, Sunny would usually end up closest to his birth-brother, Moony. Sunny gave and received so much love. He had such soulful eyes that spoke of all the love he had inside, and was so freely willing to give. Sunny's passing has left a gigantic hole in Carm's family, and especially for his birth brother who is now missing his other half. Carm, though grief stricken, has vowed to give even more love to each of her six kitties in an attempt to make up for the void that Sunny's departure has left. 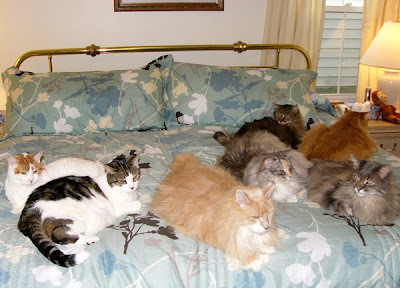 It's a tall order, indeed, but one that will be therapeutic to both Kitty Mom and her kitties. Sunny will always be remembered through the plethora of pictures that were taken of him throughout his life, and by the afterglow of all the love he gave and received during his lifetime. Love is what truly makes us immortal, as long as there is someone left to remember. 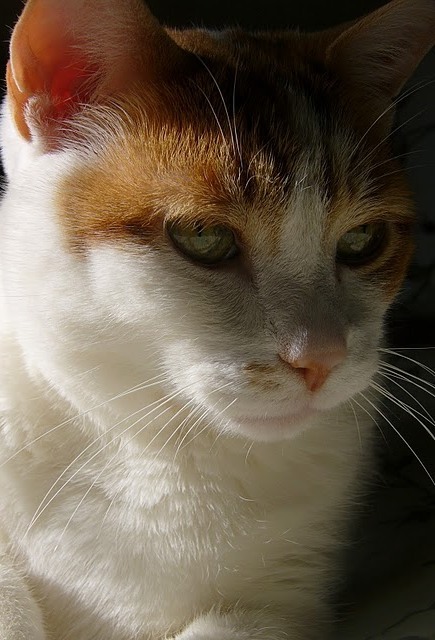 Fare well in the sunlight, sweet Sunny! What a beautiful tribute to Sunny! We were so shocked when we read about this yesterday. Thank you for filling in the story. WE know Carm and the whole family are missing their Sunshine Kitty! OH MY GOODNESS Wendy! I couldn't have written that better myself. You are a real "wordsmith" and a very dear cherished friend to be able to articulate exactly what is in our hearts at this very sad time! You have eulogized our dear boy so PURRfectly! Thank you so much- it means so very much to us! Wendy, thank you so much for this lovely tribute to Sunny. You have described Sunny's traits, his role in our family, and our feelings for him so well. We are so very sad to hear about gorgeous Sunny! What a wonderful tribute to a sweet boy. It brought tears to my eyes. 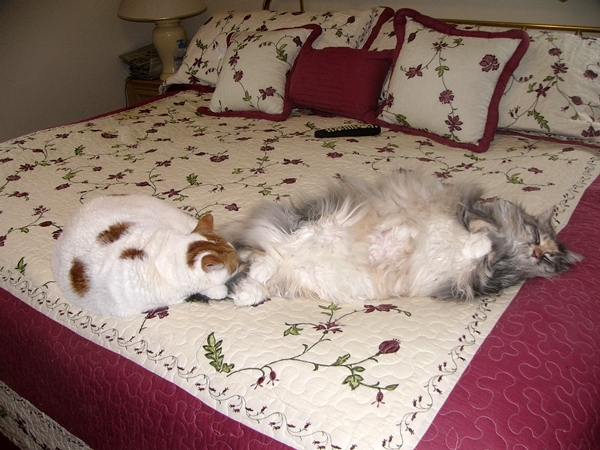 Big purrs to Sunny's family who is missing him very much. That's a beautiful tribute, Wendy. 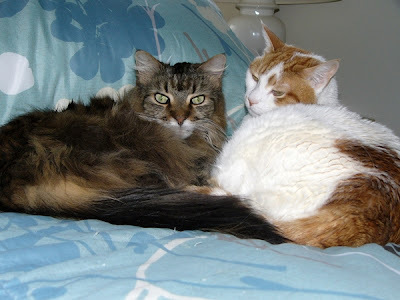 We saw that he had passed, and left our purrs, but didn't know the reason. Heart-breaking. What a lovely tribute to Sunny. May he RIP. That was a lovely tribute to Sunny. WE were very sad to see that he had left his family. Wendy, this was very moving. Wow! 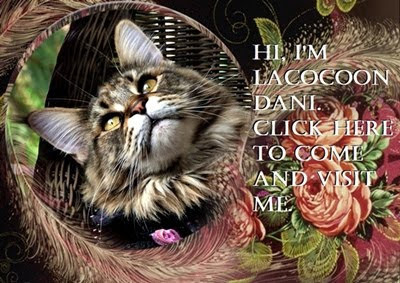 I am truly honored to have known such a special kitty. That was a wonderful tribute to Sunny! I am especially purring for Moony - I know he is really missing his brother, and this is hitting him even harder than the rest of his family. What a beautiful kitty Sunny was. I hope Moony will be okay. Rest in peace, sweet boy. That was a wonderful tribute to Sunny. My tears are flowing again! That was a beautiful loving tribute to sweet soulful Sunny. That was such a beautiful tribute. The was so much love there. That sure is a wonderful tribute to Sunny. What a great cat. There is nothing better than the bond between brothers in barn cats. I have some of that here. Thanks for telling us about Sunny. What a wonderful tribute to Sunny. Thanks for sharing him with us and me is sending purrayers to his cat brithers and sisters and his Mommy and Daddy. That was a very sweet tribute. 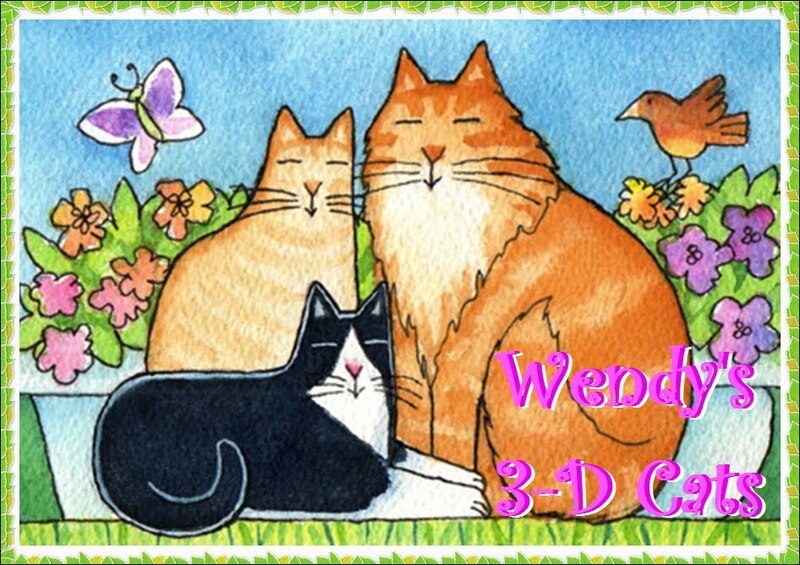 We don't know these kitties, but we send our deepest sympathies. Wendy ~ it could not have been better said. Your photos and words have touched the heart, as Sunny did. A really beautiful tribute. What a beautiful sunshine boy he was.